What’s your definition of a healthy dessert? Of a healthy cookie? Two years ago, I thought my (oh so gorgeous) apple banana cake was healthy because it had no oil or butter. Except, as a sweetener, it had sugar and honey in addition to the bananas. It used white flour. Preferring whole unprocessed foods, I have currently shunned refined flours and sugars. It is not that I don’t enjoy my sweets. I do. In moderation. I just want to have some nutrients packaged with it, too. A healthier option. I simply adore raw desserts, but often they are nut-based or sport a heavy dose of agave or coconut oil/butter. You can imagine how giddy I was when I first saw this recipe for a chocolate cookie made with black beans without any grains or nuts. No refined sugars, either. 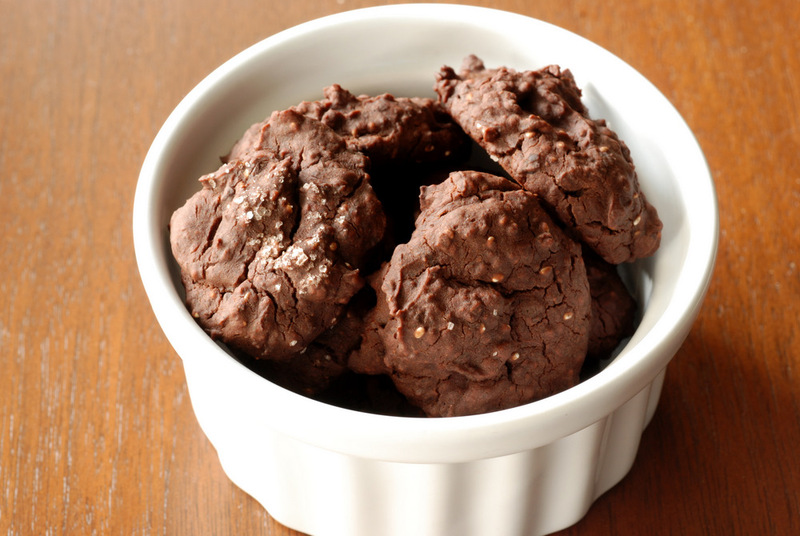 The giddiness was mostly because these cookies were made with BLACK BEANS! Sarah had a chocolate chili cherry recipe but I decided to hedge my bets and split the dough for two versions: Mint Chocolate and a Mexican Chocolate Spiced version with Dried Cherries, modeled after my Spiced Brownies. Trust me, no one will know these cookies are filled with beans. It is really unfair to quiz your guests about the secret ingredient because they taste like delicious cookies, beans or no beans. 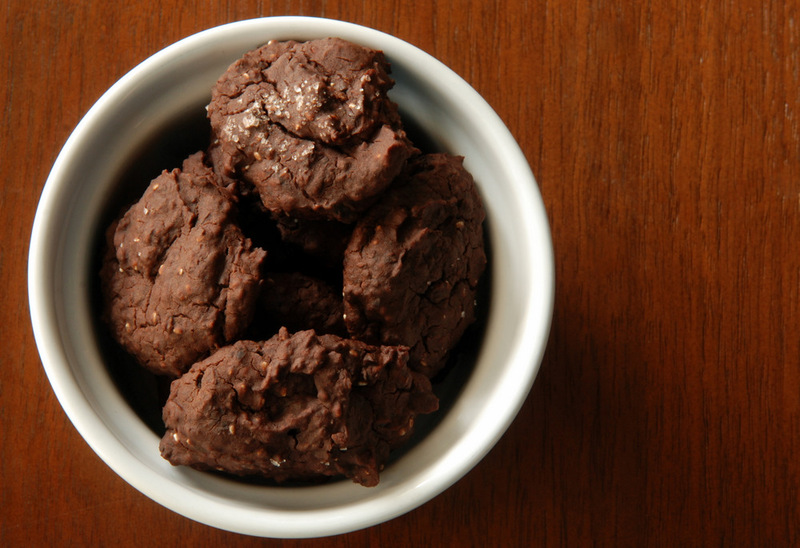 These are not fudgy cookies, but more dense than the airy banana-based cookies. A moist, fluffy cookie filled with chocolate. The chocolate mint version marries the quintessential holiday favourite flavours. You can’t go wrong with peppermint and chocolate. For round two, the Mayan-Spiced cookies have a whiff of savoury spices including cinnamon, cardamom and smoked paprika with a bit of a zip from the chili flakes. I might try increasing the spices next round because they weren’t too dominant. The dried cherries offered a nice contrast to the dark chocolate. What will round 3 entail? You tell me! I will have to whip up another batch if I want eat them over the holidays. 😉 Or maybe I will venture to finally try other bean-based desserts. This is being submitted to this month’s My Legume Love Affair, to this week’s Healthy Dessert Potluck Party, to Ricki’s Wellness Weekend and to this month’s Cookie Blog Hop. 1. Preheat oven to 375F. Line a baking sheet with parchment paper or a silpat. 2. Mix chia seeds, maple syrup, and vanilla in a small bowl or mug and set aside. 3. Place drained and well-rinsed beans, coconut oil, cocoa, salt and respective spices except the dried cherries (depending on your version) in a food processor and blend until well combined. 4. Add the liquid ingredients and pulse to incorporate. The batter will be quite liquid-y, but still hold together. Remove blade from the food processor and add chopped chocolate and dried cherries (if using). Fold to incorporate. 5. Spoon cookie batter onto lined baking sheet (I made small cookies, around 1 tbsp in size). Using the back of the spoon, flatten top of cookies slightly, as they will not spread when baking. Sprinkle with coarse sea salt (important!). Bake for 15-25 minutes until the edges begin to brown. Cool before eating. Store in the fridge. This is such a great idea! I love it. I’m going to add these to my cookie list for sure – especially the chocolate and mint ones. You had me at Chocolate Mint. i have yet to make a dessert with beans, but it’s on my list. these cookies look like they have an amazing texture! I adore chocolate and chili! I love that you have the base recipe with two variations. And mint, swoon! Thanks for linking my recipe, too! I can’t wait to try YOUR cookies! Very unusual cookies for me, incredible variations..
Wow – what an interesting cookie! Black beans…and you can’t identify the flavor? Can’t wait to give these a try! What an unusual ingredient to use in a cookies recipe! Would love to give it a go soon! I love these bean-ful cookies! I’ve made Heidi’s marathon cookies and you def can’t tell that there are beans in them. That mint chocolate is calling out to me! Those look like they have such a great texture! I love the idea of using beans in desserts, and all of your variations sound good too! Cookies! I’ve tried brownies and fudge (Ricki’s recipe and a can of black beans are sitting on my kitchen counter right now). Thank you for sharing cookies!